Discussion in 'Civ5 - General Discussions' started by Inhalaattori, Mar 22, 2010. I think its totally wrong that Native Americans have been in many previous versions of Civilization, but much more homogeneous group, Finno-Ugric tribes are not in the game. Finno-ugric tribes were the first people in Europe (with Basques), but these first people are not represented in any way in the game. These tribes were ruling Europe before Indo-European conquest. From this map you see the original area, where Finno-Ugric tribes were living. Still today there are remnants of Finno-Ugric influence. I would say Finno-Ugric tribes would be as good option as Celts or Native -Americans for Civilization expansions. The reason why they are not in, is purely that Civilization is Anglo-centric. Celts and Native Americans have common history with English speaking world and this is the reason why they are in the game. So I think its wrong to say Civilization is Eurocentric. Its West -European centric. Join the queue after Poland, Italy and Sealand, please. As shown by the picture he has posted ( http://www.helsinki.fi/~sugl_smi/kuvat/Kartat/Kielet/Fenno-Ugrian_languages.jpg ), Ugro-finnic languages still have an extensive span. Lillefix I'm serious. You can. We could have the huns, with Atilla as leader. That should be close enough to Hungarian. Please STOP with these threads! Very interesting. I am not that knowledgeable about the Pre Indo European history of Europe. Thanks for that. Still searching for the legendary city of Mapu Mapu. I'm an estonian (one of the finno-ugric people) and as much as I would love to be able to play as a Civ that is basicly my own Civ, I don't think this is a good idea. There are many other civilizations that have accomplished more than the finno-ugric people and who aren't included in the game. Besides, who would their leader be? And what would be their capital? There are same kind of problems with Native Americans, but still they have been in the Civilization series. Native Americans did not have a capital or leader for all Native Americans. Yeah, that whole civilization was just cheap imho. At least, if nothing else, we are getting little history lessons everytime we open these threads. I think they are interesting, but not compelling enough to be one of the 18 initial civilizations in CiV. At the end of the expansions there will probably be 30-35 civilizations just like the last 2 Civ games. Then when their country is not included people can start complaining....or just mod it in. Exactly. People should take it as a chance to learn new things about lesser know civilizations. I think it's a good thing. Especially since new information on ciV is not forthcoming lately. I'm just curious if all this is still meant seriously or is it just a trendy way of trolling? Realizing this is how it is, those humans have made it so you can add/create/modify to adjust to your tastes. Civ is a game - not a simulation of reality. With all due respect to the finno-ugric community, do we really need *another* white civilization in Civ???? I frankly find it a little offensive they that use the 'native american' (as opposed to 'sioux', like in the older version), as if you would have just a 'european' or 'asian' civilization instead of the many civs you find represented. Native Americans were in exactly one game in the series, not "several". In the other games, the natives were represented by actual, relatively organized, native nations: the Sioux (Civ II) and the Iroquois (Civ III). "My friends, love is better than anger. Hope is better than fear. Optimism is better than despair. So let us be loving, hopeful and optimistic. And we’ll change the world." - Jack Layton's last letter. I believe that finno-ugric civilization is fairly represented by Russia. Russians (not poles or, say, serbians) are basically slavic people mixed with finno-ugric ones. Never been in Finland myself, but when my sister went there, she said that Finnish people look just like us, and I personally look just like your average finn on the street. My personal appearance is very common for Russia, and all my known ancestors (up until some count in XIX century) are Russians. So, I really don't think that it is necessary. No offence meant for finno-ugric people, obviously, because seemingly we are, well, basically same thing. That's all I wanted to say about Vietnam. Yes, in a way that is true. This map shows the situation in 1000-1100 AD. Veps, Mari, Merya, Permians etc. 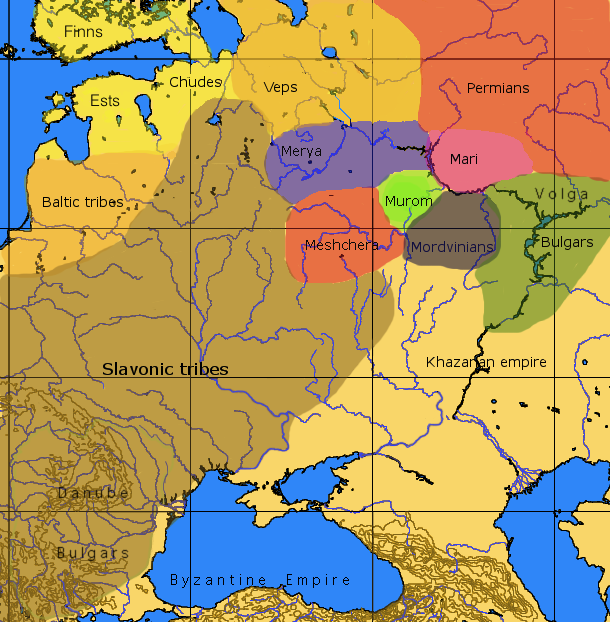 are Finno-Ugric kingdoms that were later conquered by Slavonic tribes. If Indo-Europeans would have not left their homelands and conquered Europe with their war chariots, Finno-Ugric tribes and Basques could still be in charge in most of Europe. This is why I find them interesting. Because Civilization series is about "what if? ", I think it would be interesting to see some old forgotten civilizations that "did not make it", but in other circumstances could have evolved into great Empires. I don't think that Attila can be considered an Ugro-Finnic leader. The origins of the Huns is rather mysterious (the leading theory classifies them as proto-Turkic peoples, but this is not beyond controversy). After their arrival in Europe, some Hunnic tribes developed their own ethnical identity; others were assimilated. The hunnic heritage was then transferred to several Eurasian peoples, including various Ugro-Finnic tribes (but also Turkic peoples and the Uyghurs of Western China). For that reason, the Ugro-Finnic are not be regarded as "Huns", but should be considered separately. No one is. The composition of pre-IE Europe is very speculative. And even if what Inhalaattori says is true (which it might be), there's still the obvious problem that the Finno-Ugrics weren't a civilization over the historical span of time the game is interested in. He might as well be lobbying for the inclusion of the Kurgan culture (often suspected to be the Proto-Indo-Europeans), or any of the other Neolithic cultures identifiable from archaeology. Enough with Europe already! Europe is way over-represented in the game. They are trying to include some representation from the other continents.